February is a short month – a blessing, perhaps – but that means that March is already running away with us. 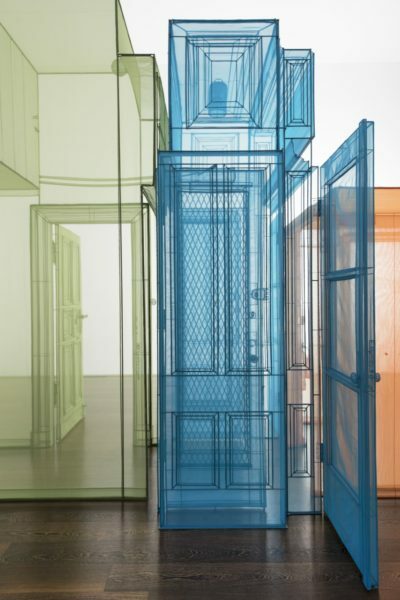 So, I want to take this opportunity to remind you not to miss this major show by Korean-born artist Do Ho Suh, his first in London with Victoria Miro gallery. 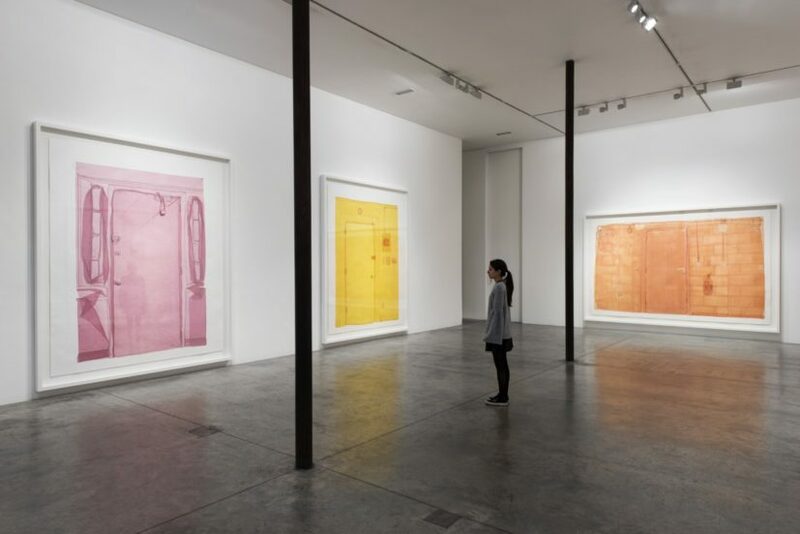 This is the most substantial exhibition of Suh’s work since his Serpentine solo presentation in 2001, and includes not only a show-stopping, large scale installation, but smaller three dimensional works as well as new works on paper and films. 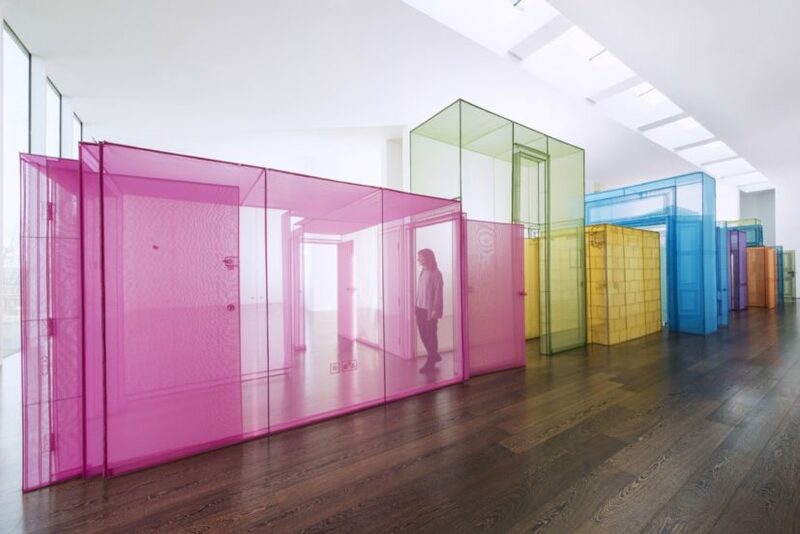 The gallery website warns visitors to avoid peak times and to be prepared to queue for Do Ho Suh. The staff at Victoria Miro will have become accustomed to managing huge crowds for their shows in recent years. Grayson Perry’s tapestries attracted record numbers of visitors to Wharf Road in 2012; last year Yayoi Kusama’s installations had visitors queuing down the street weekend after weekend. The title piece of the show: Passage/s occupies the whole of the upper gallery in the new part of the building. It is the latest of Suh’s immersive installations, inviting the visitor in, the saturated colour encouraging a kind of euphoria. With views over the rooftops of City Road, light floods through the diaphanous screens of the jewel-coloured installation, revealing every lovingly-rendered detail, every immaculate stitch. Passage/s is an architectural composite: in-between spaces from the artist’s homes in Korea, New York, Berlin and London, abutted together, colour-coded by city. The ornate carvings of the Korean home, as always translated in jade-coloured fabric, connect to the 19th century architectures of Berlin with its decorative door furniture; ceiling heights rise and fall as one walks through the sequence of narrow, domestic spaces. Doors open out on either side, emphasising these spaces as transitional, threshold areas. One is never arriving, only ever passing through. Suh has not always expressed the experience of cultural translation from Korea to the West in such harmonious terms: his work Fallen Star1/5, 2008 is a model that depicts a traditional Korean house crashed like a meteorite into a New York brownstone. 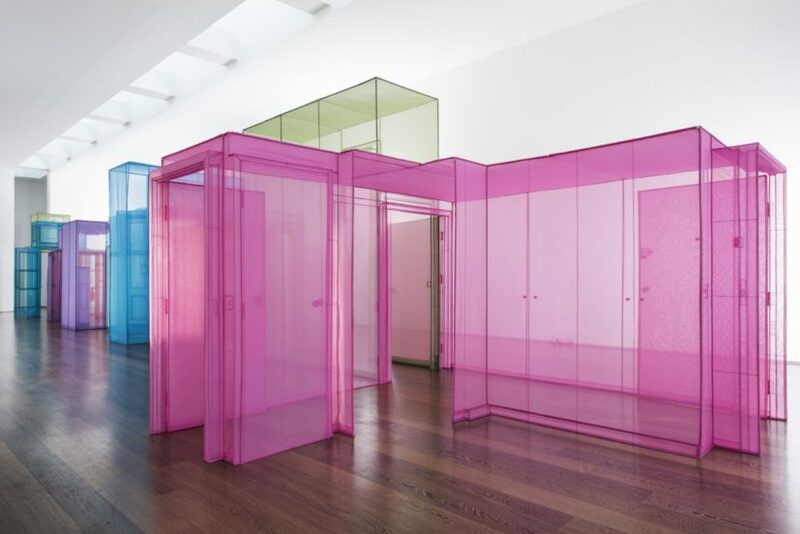 Do Ho Suh was born in Korea, and after post graduate studies at the Rhode Island School, moved to New York where he lived in the same apartment for twenty years. There were spells spent in Berlin, and later in London, where he has lived for the last five years. Migration, both physical and psychological is one of the themes of his work. But so too is the relationship of architecture, in its broadest definition, to the body. An early work, High School Uni-Form, 1997 consists of a phalanx of severe uniforms, standing empty of bodies. Suh refers to clothing as the “smallest, most intimate inhabitable space that you can actually carry” – an architecture for the body, but also a surrogate for it. 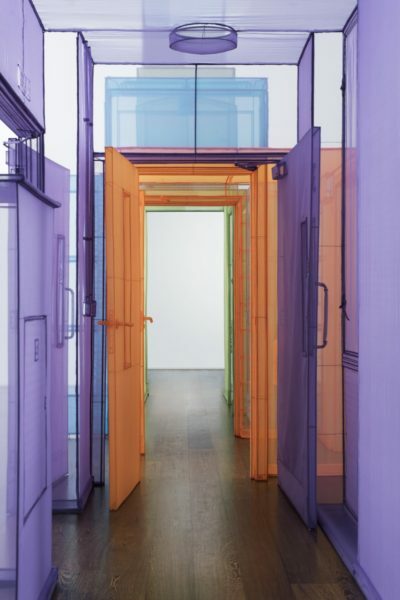 Suh brings the skills of the tailor to the creation of his architectural spaces, recreating them at 1:1 scale in brilliantly coloured translucent polyester. 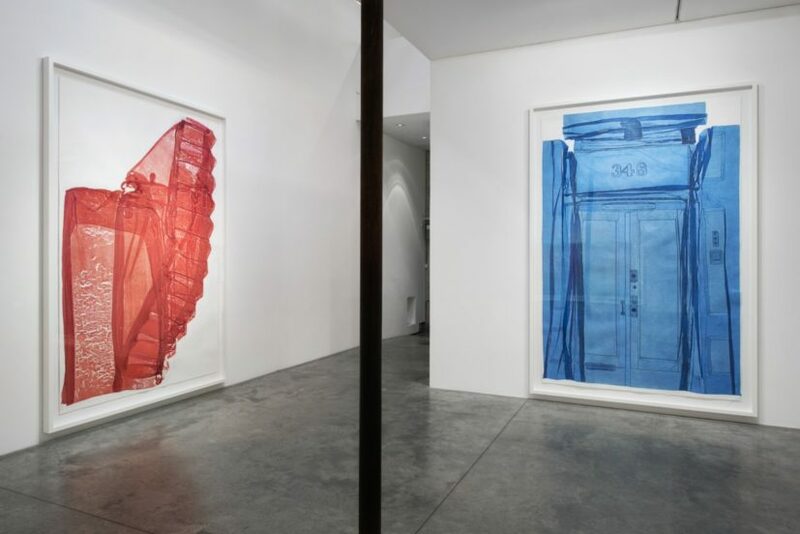 Three dimensional forms conjured out of two dimensional fabric; couturiers toiles, drawings in space; blue prints; filmy environments that flit between the rational and the disorientatingly dream-like. All these readings of the work are available. When leaving his New York apartment, the artist sought to capture the essence of his life lived there by covering every surface with paper and taking rubbings in pencil and pastel stick. It was an operation so arduous that he wore away his own finger prints in the process, literally leaving part of his identity on the fabric of the building. The new Exit series also memorialises his departure from New York. A series of works on lightboxes feature white on white, nylon models of electrical fixtures and fittings, door knobs, fairy lights: the minutiae of domestic apparatus touched every day, unthinkingly. And in the ground floor gallery, the artist is showing a series of flat works made by creating 1:1 scale 3-D models of architectural spaces in gelatine tissue that is then soaked in water and fused to paper. The Pram Project, 2014-2016, is perhaps the work that signals the most fundamental transition in Suh’s life. Settling in London five years ago coincided with the birth of his first daughter. This film was made by attaching three GoPro cameras to her buggy. 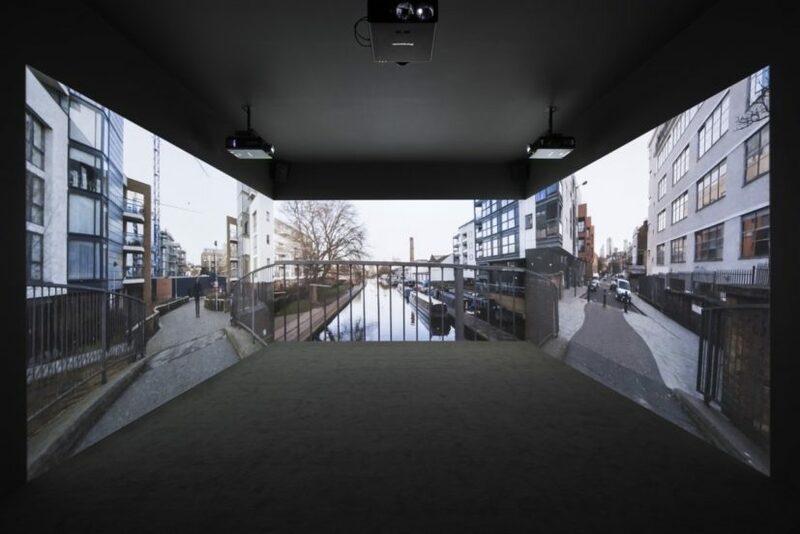 Together, father and daughter travel the streets of London and Seoul, the multiple perspective of the three-screen film mimicking perhaps the heightened attentiveness of the new arrival, or the child. These may be the early years of the next twenty year sojourn, and only a prelude to the next transition. Suh’s work communicates very strongly that we carry the idea of home within us.